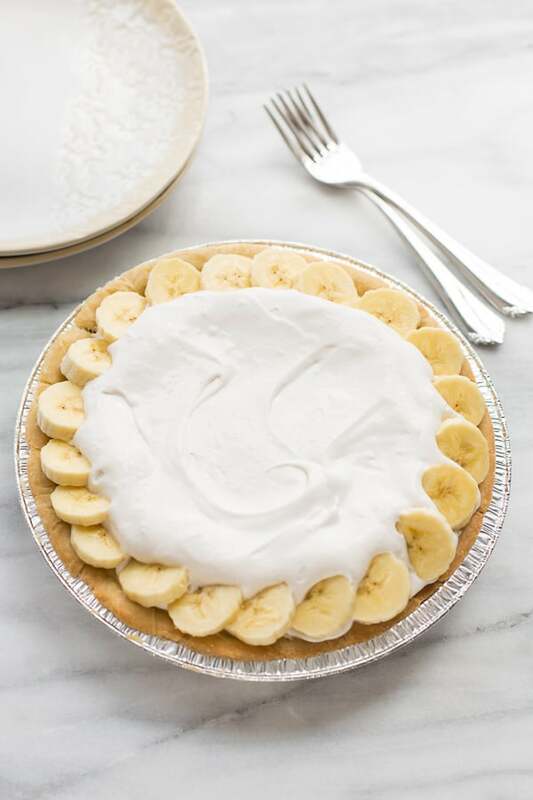 Dairy-Free Banana Cream Pie! Made with REAL dairy-free vanilla pudding. Nobody will ever guess this pie is dairy-free! Easily gluten-free using gluten-free pie crust. It’s time to think about Thanksgiving pies! Hooray! Are you a banana cream pie lover? 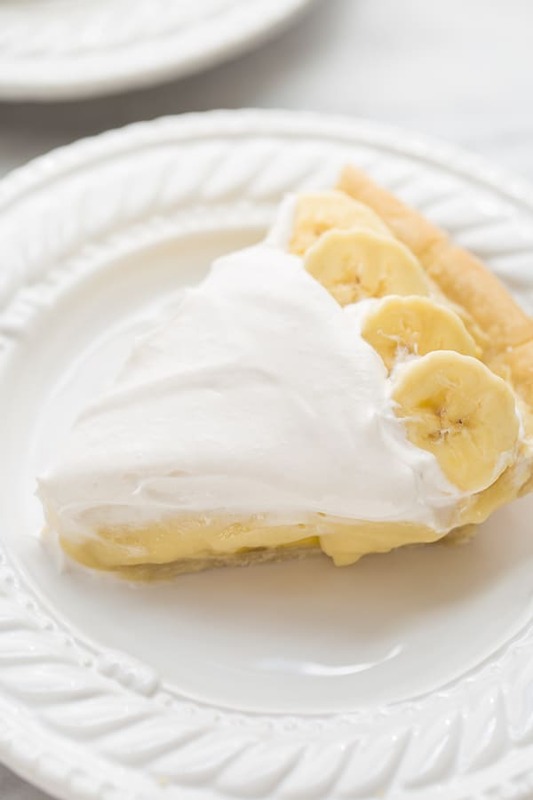 Banana cream pie usually made an appearance at my house for Thanksgiving growing up. I hadn’t had banana cream pie for years until I developed this recipe for homemade dairy-free vanilla pudding. This pudding is so creamy and delicious it definitely surpasses any boxed pudding – dairy or not. 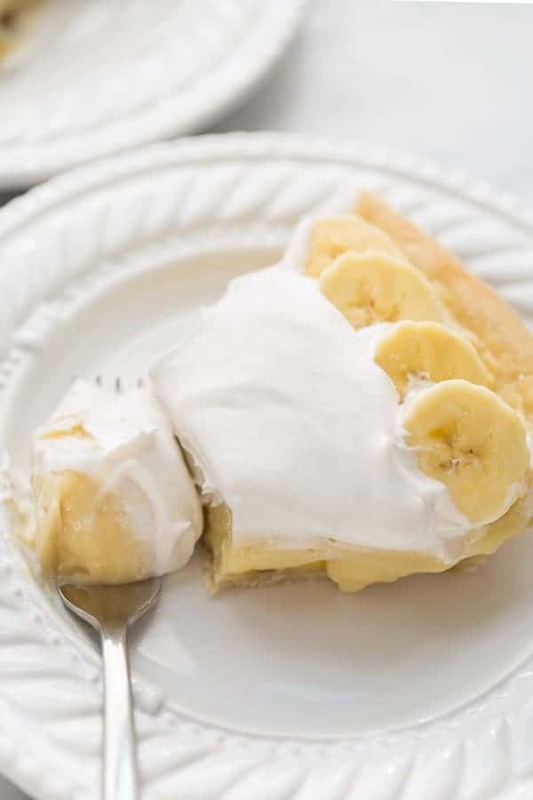 No more afterthought banana cream pie – this one is a showstopper! The dairy-free pudding is what I like to call real deal pudding. 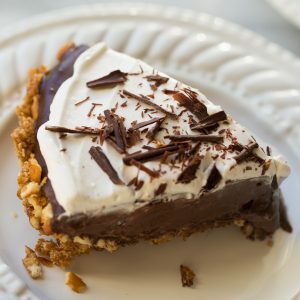 Like the chocolate pudding in this Chocolate Pudding Pretzel Pie, it is made with traditional pudding ingredients. No weird ingredients like avocado or tofu here! 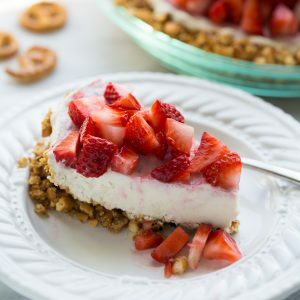 You can use any precooked pie crust you like for this pie. Just be sure it is cooked and totally cool before filling. This pie is best eaten a few hours after it’s made. That way the bananas will be fresh and the crust will still be crisp. To save time on Thanksgiving I would recommend making the crust in advance. I like to top this pie with So Delicious Coconut Whipped Cream. Nobody will ever guess it’s dairy-free! You won't believe that this banana pie is dairy free AND gluten free! Prebake the pie crust and allow to cool completely. In a medium saucepan, whisk together the sugar, cornstarch, egg yolks and salt. While whisking, slowly about 1/2 cup of the almond milk. Place the saucepan over medium heat and whisk in the remaining almond milk. Cook while whisking constantly, until the mixture begins to bubble. Once bubbling, cook for another 1-2 minutes, stirring constantly, until the pudding is thick an coats the back of a wooden spoon. Remove from heat and stir in the vegan butter and vanilla extract. Let pudding cool for 15 minutes, stirring occasionally. Place a layer of bananas along the bottom of the pie crust. Pour over the cooled pudding. Cover and refrigerate for 1-2 hours until set. Top with coconut cool whip and more bananas. Serve and enjoy! Any precooked pie crust you like will work for this pie! This pie needs to be served a few hours after it is made or the bananas will brown and the pie crust will get mushy. As a substitution note, this recipe will not work without the egg yolks. 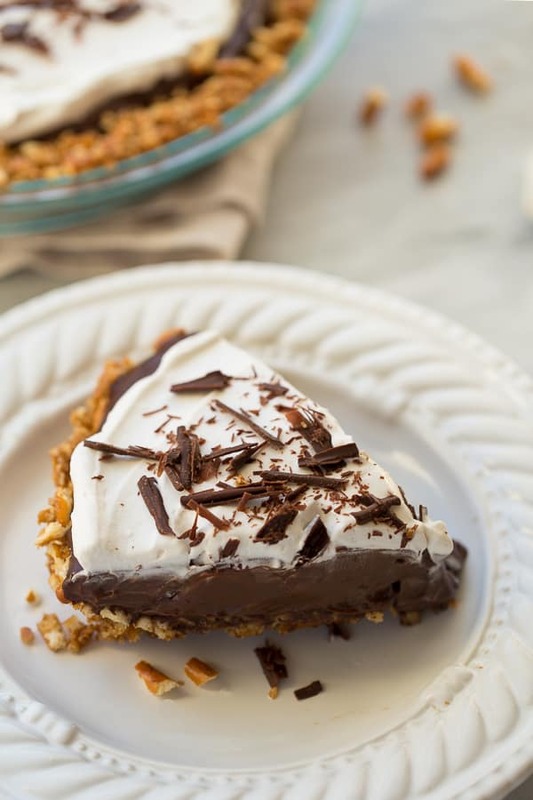 You might also like this Gluten-Free Vegan Chocolate Pudding Pretzel Pie! Hi Erin. This pie sounds mouth-watering! Just wondering if the egg yolks are added at the beginning with the sugar, corn starch and salt? Thanks and can’t wait to try this recipe! When do you add the egg yolks? Unsweetened original almond milk or unsweetened vanilla almond milk- which would you recommend? I don’t think that would work unfortunately! I would follow the recipe exactly to ensure it turns out. 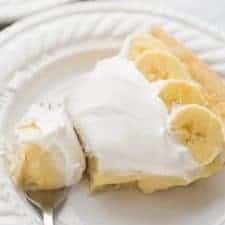 Banana cream pie is my favorite desert! But dairy issued dont let me have it. 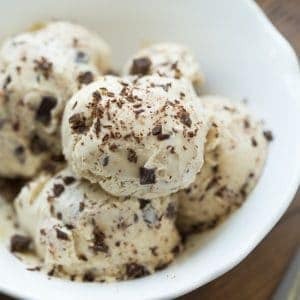 I tried this recipe and it is fantastic!! Love it! Now I can have my favorite desert! Hooray! I’m so glad it worked out for you! My pudding was thick then got runny later. Any suggestions? Would there be any replacement for eggs, that I could use? Unfortunately this recipe won’t work without the eggs. So sorry! I made this on Mother’s Day for the woman at church that can’t have gluten and dairy and everyone loved it! It looks delicious! We don’t eat dairy (which for us includes eggs) if you happen to know of a recipe that is eggless too, please post it! This looks so good! Do you think arrowroot would work instead of the corn starch? Wow! This looks AMAZING!! I can’t wait to make this later tonight! Hi. We can’t use almond milk. Do you know if this recipe would work with a coconut milk drink we make by mixing canned coconut milk with water?